The Edward G. Budd Manufacturing Company was formed in 1912 to produce the first completely successful all-steel passenger automobile body. Later the Budd Company expanded into the aircraft and bus industries before turning to the railway industry. While Budd had his engineers looking at engines to power various projects, he was approached by Hauvette Michelin of Michelin et Cie about building a self propelled railway car combining Budd's stainless steel fabrication techniques and Michelin's metal-flanged rubber tire patents. The result was the Green Goose, a demonstrator designed in September 1931 and completed in December 1931. It could carry up to 32 passengers and was powered by a diesel engine produced by the German company Junkers (later it was replaced by a more powerful gasoline engine). The car was initially tested on the Reading Company's New Hope Branch between Hatboro PA and New Hope PA.
After that the experimental car saw demonstrator service on a number of railroads in the United States. From the apparent success of the Green Goose, Budd received a few orders for similar cars. The first was from Michelin for lightweight streamlined cars equipped with French gasoline engines. The next was from the Reading Company for a 47 passenger car equipped with a Cummins diesel engine. First put into service in October 1932 and numbered Reading 65, it also was used on the New Hope Branch but due to derailments it was soon withdrawn from service. In 1933 the Pennsylvania Railroad ordered a two-unit train similar to Reading 65, and it was used on the Schuylkill Division between Norristown PA and Reading PA. After modifications, the train was sent to the Octoraro Branch and operated until 1948. It was then sold to the Washington and Old Dominion Railroad in Virginia, where it operated for more than four years before retirement. The third was from the Texas and Pacific Railroad for a two-car train dubbed the Silver Slipper. After a shaky start (it derailed on the first test run on the T&P) and even after having its troublesome rubber-tired wheels replace with standard steel wheels, it operated only one year before being taken out of service. The next foray into railcars was much more successful than the Budd-Michelin experiment. In the fall of 1932, the president of the Chicago, Burlington and Quincy Railroad, Ralph Budd (no relation to Edward Budd), solicited bids for a lightweight high-speed streamlined train. The Budd Company was awarded the contract and on April 18 1934 the Zephyr was christened at Pennsylvania Railroad's Broad Street Station in Philadelphia PA. The three car train was articulated, riding on four roller bearing trucks, one on each end and one between each of the cars. It was powered by a 600 HP engine housed in the front power car and each passenger compartment was individually air-conditioned. The train could seat 72 people, carry 25 tons of baggage and featured a 30 foot mail compartment. The train proved to be remarkably reliable and was so popular that another car was added in 1935. Renamed the Pioneer Zephyr on its second anniversary in service, it continued to operate until it was retired in 1960 to the Museum of Science and Industry in Chicago IL. Budd produced similar trains for the CB&Q such as the Denver Zephyr, Twin Cities Zephyr, California Zephyr, Mark Twain Zephyr and General Pershing Zephyr as well as the Flying Yankee for the Boston and Maine and the Maine Central Railroads. In 1934 Budd also entered the urban mass transit business with the completion of a five car train for the Brooklyn-Manhattan Transit Company in New York City NY. The train, called the Zephyr (just like its diesel-electric brother), was completed in April, delivered in June and put in service in August. Numbered 7029 A,B,C,A-1,and B-1, the 168'6" train had a seating capacity of 170 and a total capacity of 640. In 1949 Budd also built 10 R-11 cars purchased by the NYC Board of Transportation and NYC Transit Authority for the unified BMT/IND Divisions. Despite both sets of cars running for decades on the system, NYC did not place a large order with Budd until 1964. The first large mass transit order came from Budd's hometown, Philadelphia PA. In 1960 the City of Philadelphia and the Philadelphia Transportation Company ordered 270 subway cars for the city's Market-Frankford El. Thirty years after first delivering cars to NYC, the NYC Transit Authority placed an order for 600 R32/R32A cars that were delivered in 1964-65. In 1968 PATCO ordered 75 rapid transit cars for the Lindenwold Hi Speed Line that connected South Jersey communities and Philadelphia PA. Between 1981 and 1985, Maryland Mass Transit ordered 100 cars for the Baltimore Metro and Metro Dade County (Miami FL) ordered 136 for its fledgling transit system. The cars for these two systems are identical except for paint and followed the Budd Universal Rapid Transit Car (BURT) design. The city with the largest fleet of Budd built transit cars is Chicago IL. In 1969 the Chicago Transit Authority placed an order for 150 rapid transit cars, and returned to Budd for 300 more cars in 1981-83 and another 300 cars in 1984. The CTA cars were in fact the last rail cars built by Budd. In 1936 Budd produced its first standard (non-articulated) lightweight streamlined passenger car for the Atchison, Topeka and Santa Fe Railroad. Santa Fe coach number 3070 led to an order for 9 more which further led to Budd's first large order, 104 passenger cars for AT&SF's new train, the Super Chief, scheduled for delivery in 1937. Some of the last cars produced before war production took over were for the Missouri Pacific Railroad's Colorado Eagle, completed between March and June 1942. The switch from heavyweight to lightweight passenger cars was delayed due World War II, but after the war, civilian production resumed. The work was moved from the Hunting Park Plant in the Nicetown section of Philadelphia to the recently purchased Red Lion Plant in Northeast Philadelphia, which the government had built for war production. The Red Lion plant had been built for aircraft but was quickly converted to automobile frame and railcar manufacturing, with enough room on the shop floor for 80 railcars at one time. After the war there was a huge pent up demand for the new lightweight cars. For example, the CB&Q, Denver Rio Grande and Western Pacific Railroads signed the deal for a 60 car order (later increased to 66 cars) for the new California Zephyr in October of 1945 but the cars could not be delivered until 1949. New York Central led the way with a 112 car order in 1945 followed by another 127 cars in 1947. In 1951 the Pennsylvania Railroad ordered 64 cars for their flagship Boston-Washington train the Senator and New York-Washington train the Congressional. Among the other domestic railroads with substantial orders were Seaboard Air Line, Chesapeake & Ohio Railroad, Southern Railway, Norfolk & Western Railroad, Union Pacific Railroad, Southern Pacific Railroad, and the New York, New Haven and Hartford Railroad. International customers included Central Railroad of Brazil, Sorocabana Railways of Cuba and the Canadian Pacific. In 1954 the Canadian Pacific Railway, in an effort to revitalize passenger rail travel across the country with the introduction of the Canadian, placed the largest order for standard passengers cars in Budd's history (pre-Amtrak). The order for 173 cars was enough to equip 18 transcontinental trains and the price tag was a stratospheric $40 million (approximately $290 million in 2005 dollars). This was the peak of Budd's standard passenger car production. One interesting set of cars that Budd built was the Keystone train for the Pennsylvania Railroad in 1956. The cars featured a number of advancements that would be used in later designs. The train was unique in its low "rail hugging" tubular design. It featured 7 passenger cars with seating for 574 and one power car that provided head end power (HEP) to the other cars instead of the cars getting power from the locomotive. The cars also had through steam lines that allowed its operation with conventional equipment. The center of the cars were depressed and rode two feet lower than other cars, with the ends at standard platform height, and the cars featured what we call uni-body construction rather than deriving support from an steel underframe, resulting in a weight reduction of 40% over conventional cars. Due to its low center of gravity, higher speeds could be maintained in curves with greater comfort to the passengers. 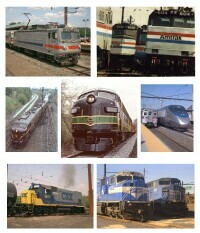 The cars operated for a dozen years between New York, Philadelphia and Pittsburgh before being retired by Penn Central. Due to a number of factors such as increased air travel, the Interstate Highway System and deferred maintenance, passenger train travel had been declining and, except for orders from Great Northern, AT&SF, CB&Q and UP, the need for long distance passenger cars declined in the 1950's. Budd did however find another market for the commuter cars. Beginning with the gallery cars built for the CB&Q in 1950, over the next 30 years they produced commuter coaches for AT&SF, Milwaukee Road, Chicago, Rock Island and Pacific Railroad, the Burlington Northern Railroad and the Chicago Regional Transportation Authority. Budd also converted 70 existing coaches for the Pennsylvania Railroad in 1963-64. The long distance passenger car business was resurrected temporarily in the 1970's with the advent of the National Passenger Railroad Corporation, aka Amtrak. With its formation in 1971, Amtrak assumed the burden of passenger railroad operations from many of the now-freight railroads and had inherited most of that equipment, much of it in disrepair. After operating with this equipment for a few years, an effort to show a new face of passenger railroading to the public was launched. Amtrak placed orders for what were originally referred to by Budd as Metroliner trailers, unpowered coaches based on the PRR/PC Metroliners. The first of what would come to be called Amfleet cars were delivered in 1975, followed by orders of 235, 200 and 150 cars each, work that would keep Budd busy into the 1980's. But those would be the last standard passenger cars built by the Budd Company. Besides the articulated streamliners, subway cars and lightweight passenger cars, the Budd Company is famous for two other types of railway cars, both self-propelled. The more famous of the two is the Rail Diesel Car, aka RDC or simply "the Budd Car". In 1939, after the success of the Zephyrs, Budd was approached by the Denver & Rio Grande Western Railroad with the intention of developing a smaller two-car train for the overnight trip between Denver CO and Salt Lake City UT. In a joint venture with the D&RGW, Budd created the Prospector, actually two train sets. Unlike the Zephyrs, which had a single power car and unpowered coaches, each unit of the Prospector was self-contained with a diesel-electric power plant under the floor. The first train was completed at the Hunting Park plant in early August 1941 and tested on the Reading Company's West Trenton Line between Philadelphia and West Trenton. Testing was sufficiently successful that on August 19 1941 the train made special runs for the press and invited guests between West Trenton and Jersey City NJ and Philadelphia PA and New York City. The next day both trains headed west. They were placed in service in November 1941 but from the start suffered from a lack of sleeping accommodations and inadequate cooling system. With a sudden dramatic increase in overnight travel in December 1941, the trains were quietly removed from service and eventually retired. After the Budd-Michelin and Prospector failures, it would be almost a decade before Budd would try again, and this time it would be a fantastic success. In 1947 Budd would have another go at it, this time without any outside influences. The RDC demonstrator, numbered 2960 and designated RDC-1, was very much an internal project and built without any prospective orders. It was tested on the Delaware Division of the PRR and then took the country by storm. It ran from coast to coast on just about every major railroad, and surprisingly, the railroads liked what they saw. Before the New York Central ordered the first RDC for delivery in early 1950, Budd had already started production of the cars in anticipation of sales, a very gutsy move. By 1962, with the delivery of the last 12 cars to the Reading Company, the little car that no one wanted sold almost 400 copies, some of which are still in use today. Major RDC buyers include Boston and Maine, Canadian Pacific, Canadian National, New York New Haven and Hartford, Baltimore and Ohio, Pennsylvania Reading Seashore Lines, and New York Central. RDC's were also sold to Australia, Brazil, Cuba and Saudi Arabia. Thirty years after the RDC was born, Budd tried to duplicate its success with the SPV-2000, an updated version of the RDC with a shell based on the proven Metroliner-Amfleet body. Unfortunately, it did not fair as well and only thirty were made and most of them were retired early in their lives. The other car type that Budd is known for is its line of Multiple Unit, or MU, cars (sometimes referred to as Electric Multiple Unit or EMU). Unlike the RDC, these cars were specialized, as they required electrification of the railroad infrastructure for operation, limiting their marketability. The first MU cars Budd built were actually made in 1957 for export to Brazil's nationalized Estrada de Ferro Santos a Jundiai (which later that year became part of Rede Ferroviaria Federal Sociedade Anonima), and were sent in both completed and in kit form for assembly there. The first domestic cars were built for the Pennsylvania Railroad. The six Pioneer III's (later referred to as the more generic Silverliner I's) were delivered in 1958 and became working test beds that led to the refinements seen in later cars. In 1963 Budd's hometown again turned to the favorite railcar building son. The Passenger Service Improvement Corporation, in conjunction with the City of Philadelphia, ordered Silverliner II's for use on both the Pennsylvania Railroad (38 cars) and the Reading Company Lines (17 cars) in and around the city and suburbs. In 1966, as part of the development of high speed MU's for the New York to Washington electrified corridor of the Pennsylvania Railroad, the Department of Commerce ordered 4 test units. These cars, T-1 through T-4, furthered the designs that led to the Pennsylvania Railroad and Budd's development of the Metroliner. The Metroliner was a semi-permanently mated pair, with cab controls on either end to eliminate the need to turn the train, and featured a tubular body and interior that were reminiscent of a jet airliner. Designed and tested at speeds of 160 MPH, they were limited to 110 MPH due to infrastructure limitations. First used on the Northeast Corridor, they were later moved to the Harrisburg Line between Philadelphia PA and Harrisburg PA, where they were renamed Capitoliners. After retirement, many of the cars were refitted as cab-control coaches for use on push-pull trains mainly on the east and west coasts. Budd also built a number of electric commuter cars for New York City transit agencies and the Long Island Railroad. Budd also built the shells for Amtrak's AEM-7 electric locomotives as well as the prototype shells for Amtrak's Viewliner sleeper and diner cars.